develop our regional public transport system, especially in the cities. About €130 million is being spent each year to improve railway safety. 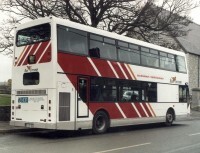 Over 500 new buses have been purchased by Dublin Bus and Bus Éireann in 1999/2000, over half of them additions to the fleet. Nearly 50 DART and suburban railcars have been acquired and a further 70 are on order. Government has also turned its attention to the institutional and regulatory restructuring of public transport to develop the right structures to deliver infrastructural investment on time and on budget and to improve the quality and availability of services. It considered proposals for a new institutional framework for public transport last April. In May it discussed proposals for a new regulatory framework for the bus market in the Greater Dublin Area. Later this year it will consider proposals for a new regulatory framework for the bus market outside Dublin. The Enterprise service to Belfast shows what a modern European - style rail service can look like. The Quality Bus Corridors, especially Stillorgan, have shown that the bus network can attract substantial additional peak hour passengers. Bus Éireann has expanded its commuter services into Dublin very substantially and continues to provide a high quality Expressway service in competition with private operators. to ensure the timely and cost effective delivery of the accelerated investment in infrastructure and facilities necessary to ensure improved public transport provision. to provide, or procure the provision through public private partnerships or otherwise, of the necessary financial resources.